Construction costs vary based on size, complexity, and detail. We had the pleasure to work with Stephen Bruns when we built our first new home. Stephen's ability to listen - really, truly, and deeply - allowed us to collaborate on a design that fit us and our lives perfectly. Three years in and we're still discovering wonderful moments - the way the light moves at different times of the year, the perfect place to store that one thing, the flow of rooms while entertaining. Any custom building project comes with challenges, but at no point in the process did we lose faith in Bruns Architecture, and should we ever build again, we will choose Stephen Bruns without hesitation. Stephen has always been great working with from our structural engineering point of view. He always has a specific vision in mind and works with his consultants to find the best solution possible to create that vision. Stephen Bruns and his team were fantastic! I particularly enjoyed and appreciated their willingness to collaborate on the project. They worked very hard to understand and respect our needs and goals for the design. The expertise and creativity they brought to the process were obvious and invaluable. Architecture is such a powerful form of artwork because it serves so many goals simultaneously. It is tempting to think of the architect as an artist and a building as another piece is his/her collection, but it must be more than that because there are real people living with this work of art. For the owner of these buildings, architecture is the realization of a dream. It speaks to the owner's beliefs about the world. It reflects their past experiences and the ambitions for the experiences they hope will come. It will define how they move and interact with family and friends. It will connect them with nature and protect them from it. It will be a collection of materials that will create and support a lifestyle. We hired Bruns Architecture to do these things for us. 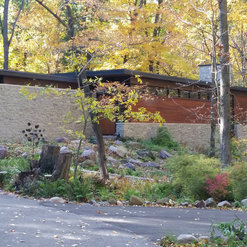 Fieldstone House is the result and we couldn't be happier. Working with Stephen starts with the baseline of high-quality modern architecture wrapped in a compelling story that begins with the land and our dreams. From the first meeting with Stephen, we knew we found the right match because he listened so intently to what we wanted in our home. He never pushed us into some "concept" he had been working on. It always felt like he was expressing our desires in his designs. The value of this can't be stressed enough because when the excitement of the new home wears away, the actual quality of the design is left for the owners to live with. We are now entering our 3rd year in Fieldstone House and we still remark at how well the home suits us. A great design is just that - a design. Great architects have that ability to help turn those wonderful drawings into reality by getting into the details with the scores of professionals who turn the project into a reality. Stephen's background as an on-site architect for projects large and small is invaluable during this phase. It takes patience and expertise to navigate the sometime conflicting incentives and timelines and still maintain design focus and integrity. 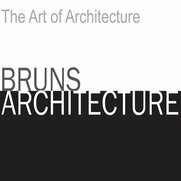 We highly recommend Bruns Architecture for your next project - and we recommend that you use them for as much of the project as you can. Having one clear vision from the initial concept until the last nail is pounded is worth more than one realizes before you get into a project like ours. Stephen Bruns and his team at Bruns Architecture are the ultimate boutique architecture firm. Having consulted on interior design for them on a new home, I can see why his clients love his thoughtful and imaginative concepts; his design presentations; their firm's process; and his relationship with the homeowners' builder as their advocate. I would not hesitate to recommend Stephen Bruns. 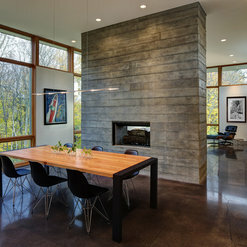 Stephen Bruns of Bruns Architecture designed our home, Bluff House. 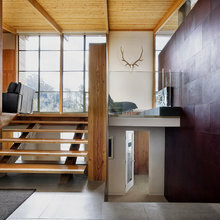 Stephen truly listened and appreciated our vision for a modern home in the woods, complete with crisp modern details, but with a hint of vintage and rustic warmth. He understood the connection we wanted between the house and its forested lot. Our home is near Devil's Lake State Park. I have fond memories of camping at Devil’s Lake and the magical feeling when waking in the morning and being greeted with crisp fresh air and a magnificent view of the surrounding forest. 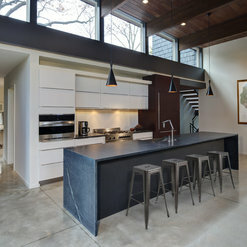 Stephen’s design captured that intangible “magic” in a tangible, beautiful, functional home we truly enjoy every day. We have worked with Stephen Bruns of Bruns Architecture on two different projects to date. The combined value of the two homes is in excess of $2,000,000 in construction cost. We have found that while Stephen is "builder friendly", his expectations for the highest building standards never waiver. His willingness to respond quickly to questions generated in the field are truly an asset to the builder. His designs are thorough, complete, well organized, and dramatic. A team player with exciting, and creative ideas is how I would summarize my experience with Bruns Architecture. Stephen and his office have been a complete pleasure to work with. Great ideas and well thought out details. Perfect. Bruns Architecture answered a question: Where can I find these chairs?. Bruns Architecture answered a question: hello, would you mind sharing what the tile is? Commented: Where can I find these chairs?.Hello. Thank you for your question and interest in our work. These chairs are the home owners' furniture - we do not have information on where to find them. Commented: hello, would you mind sharing what the tile is?Hello. Thank you for your question and interest in our work. 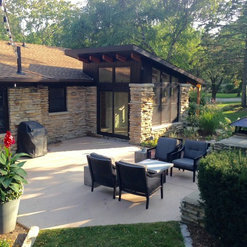 Not concrete - Belgian terra cotta from Cle Tile. Commented: pendant lightsHello. Thank you for your question and interest in our work. These lights are from a studio in Brooklyn, NY. We hope that helps. Thank you. Commented: Floor information??Hello. Thank you for your question and interest in our work. The floor is white oak, with a custom washed grey stain and finish. Thanks again! Commented: FlooringThank you for the kind words.